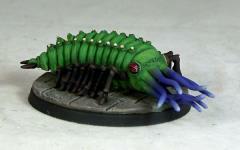 This is the first in a series of miniatures for the Labyrinth Lord game, one of a pair of Carcass Scavengers. It is a hideous giant grub, armed with a fearsome mouth and 8 tentacles. It has 16 legs and measures around 50mm in length. It is a multi-part model, supplied with 2 sprues of 8 legs, and sprue of tentacles and a separate body piece, and it is not recommended for inexperienced modelers. It was sculpted by John Pickford, and is supplied with a 50mm round plastic base.